Why people seem to think that I disagree with GATA I am not sure. I have had contact with Bill and Chris since at least 1999 over the years casually – not regularly. To the best of my knowledge they are NOT part of the crowd that claims there is no gold in Fort Knox. They differ on inventories and what is lent out I believe, but I confess I do not follow them or anyone else simply because I do not have the time. What I can say is I had personal conversations with Bill and he knew about the Buffett silver manipulation back in 1993 and how the CFTC walked into to PhiBro demanding they reveal their client. PhiBro refused and the CFTC told them to exit the trade. For him to have known that meant he had some real sources. I confess, I am not aware of what they have said about manipulations since. I, and many others in the industry, kept track of all the manipulations for they covered everything from Rhodium to US Government Bond auctions just like the LIBOR scandal. I have explained that manipulations were common in the commodity industry during the 1970s. I saw those skills migrate to Wall Street only AFTER the big commodity house PhiBro put in a bid for Salomon Brothers. Then Goldman Sachs bought J. Aaron in the mid 1980s. From there the game expanded and by 1991, Salomon got caught manipulating the Federal Government Bond auctions. Talk about guts. This scandal was then documented in the 1993 book Nightmare on Wall Street. I was one of the largest traders. So I kept track of what was going on just to make sure I did not get caught up it the nonsense. They tried persistently to get to to join the manipulation crowd. I could trade so (1) I didn’t need that, and (2) how do you know when you are the patsy? I saw Salomon use analysts to say the bonds were rising and they were selling using other brokers on the floor. They take no prisoners. There was the Robert Maxwell (1923–1991) scandal that he had stolen hundreds of millions of pounds from his own companies’ pension funds to save the companies from bankruptcy. However, behind the scenes there may have been trading losses with the club. Eventually, the pension funds were replenished with monies from investment banks Shearson Lehman and Goldman Sachs, as well as the British government. Maxwell was presumed to have fallen overboard from his luxury yacht off the Canary Islands, and his body was subsequently found floating in the Atlantic Ocean. He was buried on the Mount of Olives in Jerusalem with great official participation. The official ruling was death by accidental drowning. 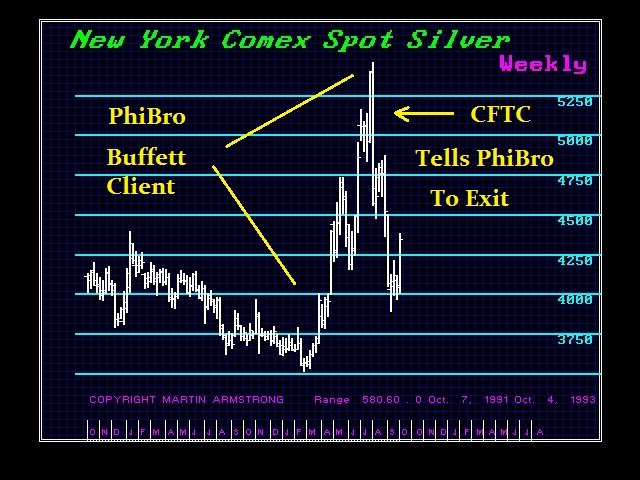 On the second Silver Manipulation PhiBro brokers walked across the floor and showed me the Buffett orders to buy desperately trying to get me to join. They did not like it when I published “they’re back” giving the price target of $7 which was met on schedule. The silver bugs hated my guts then as well because they wanted so much to believe it was real. They have these people wound around their finger knowing that if they just make the metals rise, these people will always buy the high believing this time it is different an the price will truly soar. They need these believers so they can sell the high as always and then the fake analysts say the decline is not real, its just a manipulation to force it down (assuming the rise was real of course), so just keep buying. It works EVERY time!. When I say they are at it again, I get the hate mail because these people cannot wait to hand the bankers their money every time. For the whole Long-Term Capital Management collapse and Russia, they tried to get me involved. I was invited to the IMF dinner just to impress me that they had the IMF in the palm of their hand just like they have the US government today. I refused to get involved, yet they knew I knew everything. When Russia collapsed in 1998, they blamed me saying I had more influence than all the politicians they could buy. They do not believe in real markets – only rigging the game. That is why they do not consider risk when you bribe everything you do not even consider what if you are wrong. That is why they ALWAYS need bailouts. The strange thing is when my case began I believed it was really about the fact I refused to play ball with the New York boys since the contracts were clear – we bought the portfolios outright and were NOT managing their money. An idiot could just read the contracts and the accounts were ours – not client’s with a limited power of attorney. I had documented EVERY manipulation with hard evidence and taped EVERY phone call as insurance. So when they started the case and removed press that knew the truth, I understood the game was afoot. I believe they were illegally tapping my lawyers for somehow they found out I had split up that evidence and gave it to two law firms for safekeeping. They went after my lawyers threatening to throw them in jail unless they turnover that evidence. The lawyer pressing for it that day was Martin Glen who I believe was rewarded with a Judgeship and coincidentally is the presiding judge over M.F. Global who protected once again the NY banks. The receiver Alan Cohen I believe was rewarded by giving him a board position in Goldman Sachs. I guess another coincidence. The SEC head of enforcement was Andrew Geist. who selected the law firm O’Melveny & Myers to get all this evidence and then resigned from the SEC and became a partner in that very law firm – coincidence once again of course. The CFTC prosecutor Dennis O’Kkeefe was disbarred for misconduct in the other case at that time charging Sumitomo for manipulating copper not mentioning at all the NY boys or how Sumitomo was trying to defend its positions rather than “manipulate” absorbing the short sales of the NY boys so I believe they had the CFTC taken Sumitomo out of the game making them a fortune.. So I am not sure what GATA writes or asserts. I can say we agreed that there was targeted manipulation. I do not see systemic manipulation on a long-term basis for they simply want the money now. They could care less what the market may be. If they can rig the game – it’s on. Other than that, my comments are in regard to the hate mail I get and not directed at what anyone writes since I do not read them. I fail to see why people are so passionate about buying every high from people the deliberately get the markets up knowing they will rush in to buy the high every time. What is so bloody wrong about buying lows where you know where support is and you can buy more? Trading and hedging are different than buying gold coins and silver coins for a rainy day. But unless you understand what is really going on, you will not have the courage to buy in the middle of a panic. My objections in Court to the seizure of all the evidence that would have put the NY boys behind bars had there been a real prosecution and regulators not on the take is here below: February 7th, 2000 Transcripts South District of New York before Judge Richard Owen.